Simple & Practical: End of ERP as we know it? Ideas and practical tips for software professionals. End of ERP as we know it? A friend of mine on Facebook drew my attention to this blog post, 'End of ERP' by Tien Tzuo on Forbes.com. With the professional lives of millions tied to ERP in some way, I can imagine the buzz this post must be creating. SAP, being the The biggest ERP software maker in the world and the parent company of my employer, I read this with interest. So as to not be influenced by others' arguments, I haven't read any responses to this post yet. If you haven't already, you can read the original post by Tien Tzuo here. To get your opinion on this matter, I have created a short survey of only 5 questions that you can access by clicking here. I will publish the results of the survey soon. A link to the survey also appears at the bottom of this post for your convenience. In my opinion, this notable (reputation derived from the fact that it appeared on Forbes) post is way biased, as many posts often are. Could Tien's earlier job at SalesForce.com as a marketing officer be the reason? Predicting the end of something epic or a most trusted technology, is sure to generate a lot of buzz, which is what bloggers often set out to do. The post would have been a lot better and valuable had he compared ERP's strengths and weaknesses and explained why the weaknesses are so glaring that ERP customers would be willing to walk away from ERP, something so crucial to their existence. There is no success for a case that lacks even a semblance of honest acknowledgment of the other side of the argument. In support of his argument, Tien mentions some key changes in consumer behavior and consumption patterns. The change in the ways customers engage with a company is driving ERP to its inevitable death. This is the main theme in 'End of ERP'. The services based consumption is rapidly increasing, but it can be applied only to so many things. By focusing on this alone, isn’t Tien forgetting the business processes around other product segments? Like food, energy, health and vehicles, there are simply too many things we cannot subscribe to and consume remotely. All standard functions of an ERP are still required for those sectors, aren't they? A customer may stop buying cars and instead rent from Zipcar, but cars will still have to be made, sold and bought. How would companies manage their businesses and have consolidated views of them without ERP? Tien also mentions companies like SalesForce.com and touts their successes as the proof that companies are moving away from ERP. SalesForce doesn’t offer anything other than CRM, does it? Does it provide finance, HR or materials management modules of ERP? I guess not. You can’t just run a big company effectively by mish- mashing different services from ten different vendors. That's why ERP exists and will keep it's market share in the enterprise segment. I do agree, however, that cloudification (I know, I know it's not a word in the English dictionary) of business functions is an irreversible trend. Oracle and SAP’s acquisitions of Taleo and SuccessFactors, respectively, are an indication of their grudging acceptance of this fact. The key to their success is not the demand for ERP in the cloud, which is ever present, but their ability to integrate acquired companies and their products to provide the same kind of comprehensive tool set as ERP. “End of ERP” concludes by highlighting some key business requirements that according to Tien, are not met by ERP today. Without going in to details, it suffices to say that ERP is not meant to be a silver bullet for all business problems. It does what it does while ERP providers and its ecosystem try to find solutions to the unresolved business problems. Doesn’t business intelligence (BI) software aim to solve the kind of issues he mentions? The case in point is, there are a number of ways to mine information that you need. The importance of BI is undeniable and that's what vendors are investing millions in. The enormous response to SAP's in-memory analytics appliance HANA is just an example of how innovative products will meet the business requirements of today. While the business problems mentioned in the post may be genuine, they simply highlight opportunities for ERP’s improvement and do not in any way spell doom for it. A nice read Mama! Not that I know too much about ERP, but from a basic understanding and after going through The End Of ERP post; I quite agree with your view. In fact, I'd go one step further and say that a lot of the current ERP drawbacks listed in the post are actually going to propel a rechristened ERP - something that adapts to customer centric and subscription transactions. I do believe ERP systems will be evolving over the years. Their important lies in the business process optimization and streamlining that results in better efficiency and cost savings. So it is silly to think that they will suddenly disappear. I read the article that Tien Tzuo wrote. I think it is worth discarding it since he merely wants to grab attention without any relevant justification. We all know that ERP systems are moving towards cloud deployment and delivery and there is nothing new about it. It reminds me of the famous article "Does IT matter" by Nicolas Carr. I do believe that ERP will increasingly turn into a commodity to an extent it does not matter who is your ERP provider. What will distinguish between one ERP provider to another though would be things like Business Intelligence etc that would give companies competitive advantage. That is where future of ERP (and money) lies ! ERP software should not require the data in the front office to become a key resource, as this will result in the process after a series of errors and adverse events. Great information.Thanks for sharing this useful information with all of us.Keep sharing more in the future. Have a nice time ahead. Salesforce itself is not ERP per se, but the Force.com platform allows people to develop ERP on a SAAS platform. A good example of this is Kenandy ERP - Built on Salesforce's platform. Thanks for the link too. Thanks for your great information about End of ERP as we know it? 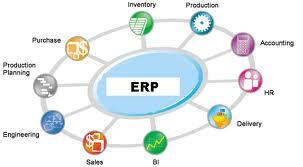 Swash Convergence provides ERP Software Solution in the Global market on affordable price. Thanks for all the valuable information about the ERP software.